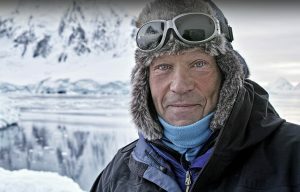 Robert Swan, OBE, polar adventurer and founder of the 2041 Foundation. Justin interviews Robert Swan, OBE and Chris Powell, Commvault’s Chief Marketing Officer, at the CommvaultGO conference in Maryland, VA 2017. They talk about motivating people, and how being positive doesn’t mean never criticising things. Robert talks about the importance of having a diverse team of people, and how he approaches building a team with the right mix of skills and experience. They discuss how people need to see results from their involvement, and that constant slog with no reward is demoralising. Robert talks about remaining relevant in a changing world, and being able to inspire young people to get involved. Chris and Robert explain that Commvault’s involvement isn’t just empty marketing, and Chris talks about the infectious charisma that Robert has. Chris has been running up hills dragging a tire training for this trip, so it’s not just a bit of silly marketing fluff, and I can attest to the palpable intensity that Robert has. Robert Swan’s 2041.com website, and the South Pole Energy Challenge. The CommvaultGO 2017 conference website. 2041 has an Instagram feed.